You know what’s better than one pattern of the month? TWO PATTERNS OF THE MONTH! This month we are celebrating classic and effortless style with Moneta and Wren. These knit patterns offer comfort and style, perfect for layering through the final days of winter and first days of spring. Stay tuned through the month of February for a pattern hack plus other goodies. 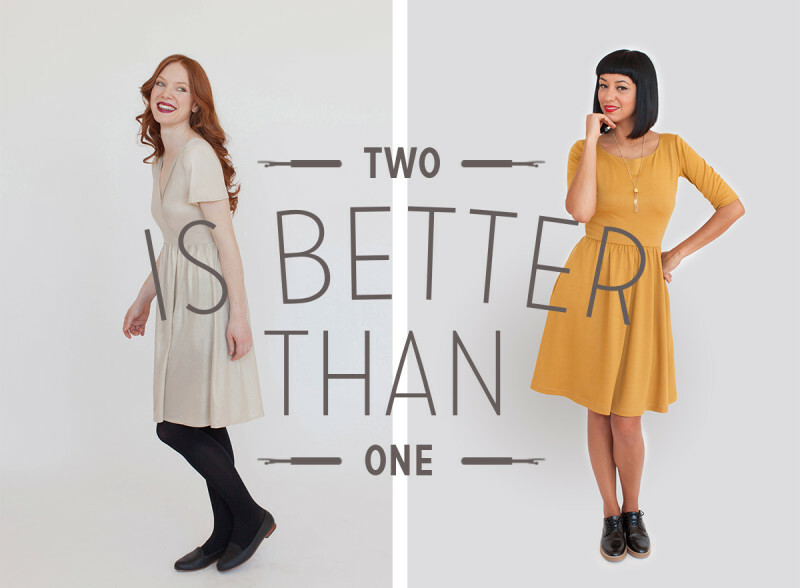 All February, get 20% off Moneta and Wren when you use to code KNITLOVE at check out. Could you please post how to lengthen sleeves for Wren? I want to make it with three quarter or long sleeves. Maybe, I could use sleeves from Moneta? Thanks! We are working on some sleeve related goodies, so stay tuned! Such a sweet deal! I’ve had some problems getting the code to work, though – does it apply to digital patterns? Yes, it does. We had a little hiccup with the code, but if you try again, it will work! It worked perfectly. Thank you! This pattern has been on my to-sew list for a while. I love both these patterns and I was hoping you would continue with the pattern of the month series! wish you would show these on some larger ladies. a size 12 would be nice. Hi Carol, As a size 12 lady I know I love to see garments modeled on women with a curvier frame. I am working on a modification to share with you all next week, and I will be modeling the dress myself. Can you tell me if the pattern is closed on the bottom part where the skirt is or if the skirt is an open wrap? It’s hard to tell from the picture. Wrap skirts sometimes blow open and I prefer to have a closed skirt. I want to know this before I decide on purchasing the pattern. Hi Cindy, both skirt options for Wren are fixed and not wrap skirts. You can see more clear examples here.